I lost one of my small circle of friends yesterday, Aug. 25. In spite of radiation treatment and chemotherapy, Nick was gone from a fast moving cancer in about a month after diagnosis. He was 56. Nick was not a model railroader. Other than that, we shared several interests and our outlook on life was almost identical. We both would defer gratification. We both were pack rat collectors. And we both had more projects contemplated than could be accomplished in several lifetimes. On the latter two points, Nick was much worse than I.
I believe that nothing in the Lord's plan is for naught; even a tragedy like this death. Nick's death has reinforced a couple of things pertinent to model railroading: don't put it off and resize your expectations. 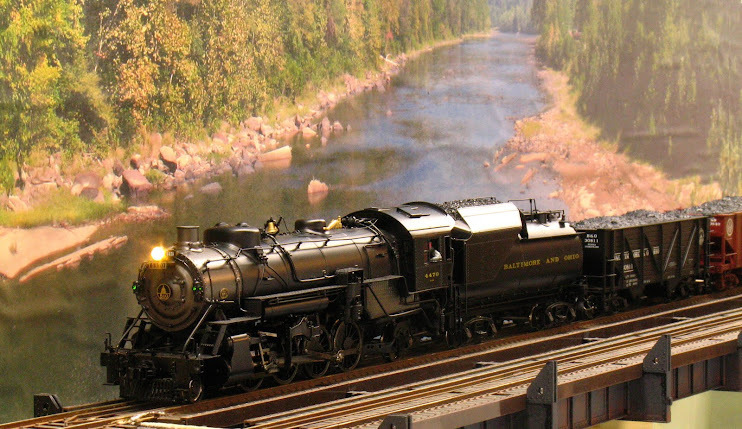 Starting my first large model railroad at age 55, I had already lamented the first lesson. I got so much enjoyment, such a sense of accomplishment out of building my model railroad that I already regretted not having started sooner. But during all of the previous years, delaying the gratification of building a model railroad seemed like the logical thing to do at the time. In some cases I had "direct encouragement" ("Why don't you put that off until after retirement?"). Death, as in my friend's case, does not always respect your plans. My advice to all who are still in the armchair is don't wait, you'll be a whole lot happier. The other lesson, one that I had just embarked on a few weeks previous, is to downsize your life to meet reasonable expectations. In this vein, I had begun to sell off equipment that I was not likely to use on this railroad because, although I would like to think that a bigger model railroad was just over the horizion, the reality is that I will be lucky to finish the one that is currently under construction. Being so close to another's untimely death has reinforced that reality. So I am going to downsize my model railroad collection as well as equipment for another hobby that I pursue where I also have way too much stuff. I will use this opportunity to upgrade my roster while I thin the herd. By the same token, projects that have no reasonable completion date will be abandoned. I will be stepping up my production of articles for model railroad publications. I have two already accepted and potentially two more. I will continue to write articles, possibly a book, and for this blog as well. A good idea is no good if it's in my head and never gets out. Finally, I had been dipping my toe into some small scale model railroad manufacturing; now I'm going to put the whole foot in. I'm moving ahead on several small projects that will be offered for sale, initially in the O Scale community, but potentially in other scales. More on that in a subsequent post. Rest in peace, Nick. I will miss you more than I can say. Even in death, you are a good friend. Very, very sorry for your loss. I loss a similarly close friend about 2 months ago. It is sad, sobering, and can cause real evaluation. Just happy we will always be able to carry a part of these good friends with us. They are more valuable than anything.